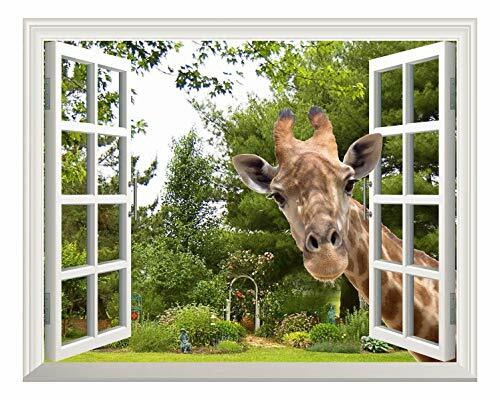 Wall26 Creative Wall Sticker Removable Wall Art Wall Decal - A Curious Giraffe Sticking Its Head into an Open Window | Cute & Funny Wall Mural - 24"x32"
This wall sticker is the first thing people see after opening the door to our cafe bathroom. Often a surprise for the unsuspecting, sometimes a shock for the deep-in-thought but always fun. This whimsical wall decal really brightens up a room. I thought it would be difficult to apply to the wall but it was actually easy. Hilarious and sweet! Great quality! When placed in the wall, definitely gives the illusion of an open window which makes the room more interesting. Christmas present for my daughter. She has loved giraffes ever since I took her to a wild animal park when she was about five. She was so in awe of the giraffes a very "helpful" stranger sitting in the next row told her that at the end of the tour she would be given a baby giraffe to take home. So no stuffed animal would do, and we ended up leaving with one very disappointed little girl who thought she was being cheated out of her baby giraffe. She has been collecting them ever since. She was more than thrilled with this wall art. I think it was one of her favorite gifts this year. Have behind my desk at work. Someone watching my back always.